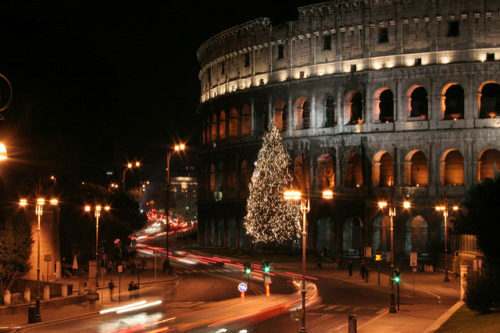 Rome is one of the top Italian tourist place to visit during the Christmas holidays. The celebration of Christmas actually originated from here. Why? It is recorded that the first Christmas mass was hold at the Church of Santa Maria Maggiore. For the Rome Jubilee in 1300 it was created a permanent nativity, the first ever known. So we are here and where is the party? The magnificent Christmas sights during the Christmas season starts from early December and goes through Epiphany, meaning on January 6. Rome’s main streets are decorated with shining lights: underneath musicians entertain the visitors passing by and vendors sell exquisite roasted chestnuts. For a Christmas shopping it is better to venture in the little streets close Piazza di Spagna. Close to Castel Sant’Angelo instead you can find an outdoor ice skating rink, open daily from 10:00 to midnight, and close there is also a small Christmas market. Each year you can visit the huge Christmas tree in Saint Peter’s Square: for the life-size nativity you need to wait until Christmas Eve.Also in Saint Peter’s Square an emotional moment is the midnight mass on Christmas Eve inside Saint Peter’s Basilica and when the Pope greets the audience with his Christmas message at noon on Christmas Day from the window of Palazzi Vaticani. In December Rome’s incredible Baroque Piazza Navona sees the presence of a huge Christmas market. You will find stalls selling all kinds of seasonal sweets, toys, but also thi is the right time to buy nativity figures, Christmas decorations, and of course thousands of gifts. There’s a merry-go-round and Father Christmas, makes his funny appearance to amuse the kids…and the grown-ups. A large nativity scene finds its place in the square later in December. Fantastic are the nativity scenes in the main churches: in Santa Maria Maggiore there is the oldest “presepe“, a permanent nativity scene which was carved in marble by Arnolfo di Cambio in the late 13th century, on display in the museum of Santa Maria Maggiore. Here again, below the altar, you can find a reliquary which is said to contain pieces of the original manger!!! The Church of Saints Cosma and Damiano displays one of the largest nativity scenes. commissioned by Charles II of Naples to six master woodcarvers, who worked on the scene from 1780 through 1820. This is the presepe that started the Naples style nativity! Rome celebrates also with the large Jewish population it presents. Hanukkah is an important holiday celebrated in December for the Jewish world. A large Menorrah is present in Piazza Barberini: one candle is lit up each night during the Hanukkah period. This entry was posted on Sunday, December 16th, 2012 at 11:40 pm	and is filed under Events in Italy. You can follow any responses to this entry through the RSS 2.0 feed. You can leave a response, or trackback from your own site.